Kizuna announced that applications for the 2018 Leadership program are now available online at www.gokizuna.org. High school students are encouraged to get engaged in a summer filled with leadership development and community service. 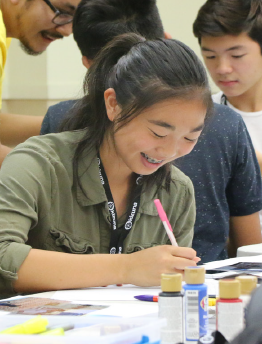 Kizuna’s Leadership (formerly called Youth CAN) program offers high school students a unique summer opportunity to discover their passion for being involved in the Japanese American community. Students are able to find how they can personally contribute to the community, as well as develop skills and experiences in leadership. The leadership program seeks to build a future for the Japanese American community through the development of a new generation of community leaders who are passionate, effective, and aware. Kizuna’s model of success is centered around developing well-rounded students with a strong self-identity that propels them in an increasingly complex world. The program runs from June 13 to Aug. 15, occurring on Wednesday evenings from 6 to 9:30 p.m. Over the course of the 10 weekly sessions, students engage in interactive workshops, discover personal identity, explore community issues and address critical needs in the Japanese American community through community service projects. The program has three tracks, two of which are brand new. Each track provides unique and valuable experiences that build upon each other. Track 1 is for students who are new to leadership and Little Tokyo. This track introduces students to the Little Tokyo Community in Los Angeles by visiting the people and places that make it the vibrant community it is. Track 2 takes our students’ education a step further and introduces concepts of identity, community and leadership. Incoming students learn the basics of the Japanese American community and history, as well as discover their individual role in the community’s future. Track 3 is designed for returning students and focuses on advanced skills in leadership and personal development. Students will apply the skills they have learned to create and implement a project that will have a positive impact on the community. These tracks combined allow a continual space for high school students to be engaged in the Nikkei community annually during the summer.The leadership program is one of the several programs hosted by Kizuna, who seek to build a pipeline of leadership for the Japanese American community. Together, these programs offer a wide variety of learning experiences and ensure commitment from a next generation of youth. For more information about the program, including how to apply online, visit www.gokizuna.org. For additional questions, contact Hideki Fukusumi at [email protected] or call (213) 973-4465, ext. 7.